I am the intern for LUXE this summer. I am going to be a senior at Central Michigan University, studying Fashion Merchandising and Marketing. This summer I am very excited to learn the events side of this industry during my internship with LUXE. A new job can be very intimidating, not knowing anyone and being “the new guy”, at LUXE this was not the case. The moment I walked in the door on my first day I was welcomed with open arms. The staff here has formed relationships stronger than just co-workers, they are truly one big family. The foundation that Colleen and Crystal have built this company on is what makes Luxe Event Linen special, setting it apart from any other company I have worked for. Being able to “play” around with different looks in the showroom, I realized the vast selection that LUXE has to offer. There are many different linens, chairs, and chargers available in order to create a table setting that matches your own style. We have anything from classic and elegant to rustic and trendy. An elegant look was created by using the Champagne Matte Satin Linen with the Florence Overlay. 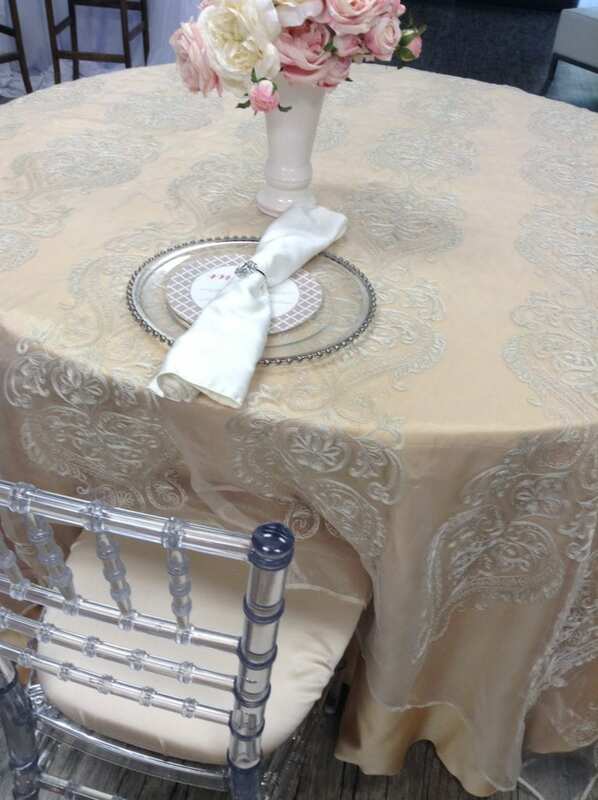 We paired the linens with our clear Chiavari Chair and Champagne Chair Bonnet. This place setting is decorated with the glass beaded charger plate, ivory napkin, and Diamond Vintage Napkin Ring. The barnyard chic look pictured above was created with the Charcoal Panama Linen. Our navy satin napkin is tied around the charger with a glitz napkin ring to add a touch of bling. 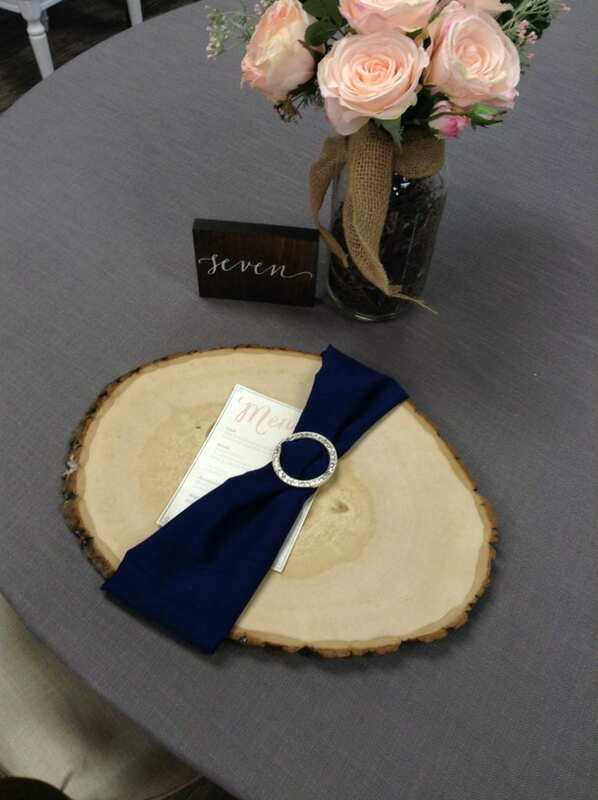 Wood charger plates and wooden table numbers add a more natural finish to the place setting. Complete the look by finishing it off with our farmhouse chair! Check out our Pinterest for more inspiration! Can’t wait to see what ideas you can create for your event when you come in for a consultation with our stylist. Look forward to seeing you soon! Check out this video for a little inside look behind the scenes at Luxe!